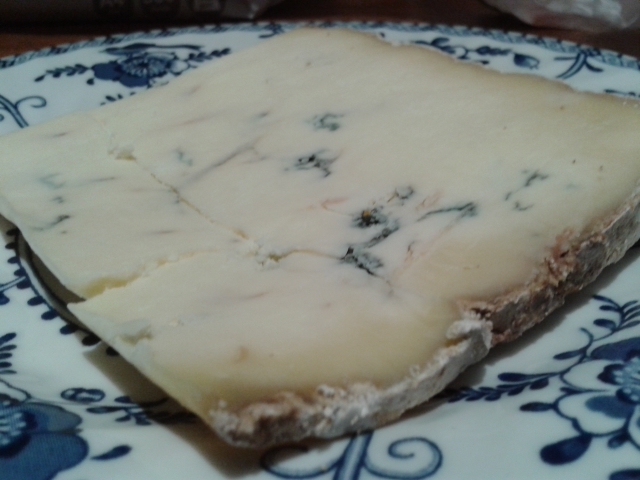 Stichelton is a blue, organic, unpasteurised cheese produced by Joe Schneider on Collingthwaite Farm, Nottinghamshire. And the key word in that description is unpasteurised. Essentially, Stichelton is made to the same recipe as Stilton, indeed you might even say it is a Stilton but even writing that sentence down in public has probably set off alarm bells somewhere in the Midlands, as the Stilton Cheesemakers’ Association are most emphatic that Stichelton Is Not A Stilton, the reason being that Stichelton is made with raw (i.e. unpasteurised) milk. Stilton is one of the few UK products to hold Protected Designation of Origin (PDO) status and one of its rules is that all Stilton must be made with pasteurised milk. This wasn’t the case until 1989 when, shortly before Christmas, there was an outbreak of food poisoning and the only food which appeared to link them all was Stilton. Colston Bassett, the last dairy then producing Stilton with raw milk were panicked into pasteurisation (even though the incident was never traced to them), the Minister of Health threatened to ban all unpasteurised cheeses and the Stilton Cheesemakers’ Association amended the PDO certificate so that all Stilton had to be made with pasteurised milk. Stichelton was conceived over a pint of beer in 2004 when Randolph Hodgson (founder of Neal’s Yard Dairy) and American cheese-maker Joe Schneider decided to bring raw milk Stilton back from oblivion. Cheese purists such as Hodgson believe that the pasteurisation process, as well as killing ‘the nasties’ (technical term there) also polishes off good bacteria, enzymes and proteins which contribute complexity to a cheese. By 2006, after finding and establishing a dairy and attempting and failing to obtain the blessing of the Stilton Cheesemakers’ Association, Stichelton was born and named after what is thought to be the Saxon English name for the village of Stilton. Stichelton is a cheese made gently and with care. The milk comes from the farm’s organic herd of 150 Friesian-Holstein cows and is pumped straight from the milking parlour to the nearby dairy using a slow and gentle pump so as not to damage the structure of the milk. The penicillium mould is added and the milk is gently warmed up before the starter culture is added. Schneider uses a traditional ‘pint starter’ rather than a freeze-dried commercial starter (starter cultures are ‘good’ bacteria that are added to the milk to convert lactose, the sugar in milk, into lactic acid.) A pint starter is essentially a pint of pasteurised milk containing strains of ‘good’ bacteria that are from the place where the cheese is made, that must be defrosted and slightly warmed to ‘wake up’ the bugs. Whereas freeze-dried starters will produce consistent results, it’s thought that pint starters produce a much more complex cheese flavour. After the starter has been added, they leave it for an hour so that the bacteria can start to grow and then add a small amount of rennet. The resulting curd is hand-cut into sugar cube size pieces and allowed to sink to the bottom of the vat. It sits there for a couple of hours before the whey is skimmed off and then, very gently and very slowly, the curds are scooped out and layered up onto a draining table lined with cheesecloth. Left there, it drains more whey and begins to acidify before being milled into walnut-sized pieces and salted. The milled curd is tipped into tall round hoops and left alone to drain for a few days, apart from being kept warm and turned each day. My favourite bit of this whole description is that the cheeses are then moved from the ‘hastening room’ to the ‘rubbing up room’ (I’ve been to nightclubs like that.) Rubbing up a Stilton (or indeed, a Stichelton) involves scraping and smoothing the sides as if you are icing a cake, so that it forms a nice coat. They then dry out for a couple of weeks before being pierced so that blue mould can start to do its work. And the big question – what does it taste like? Well, I’m a big fan of decent Stiltons and it was right up there with the best of them, creamy and buttery with the spicy hit of the blue veins. I don’t claim to have a connoisseur’s tastebuds and so I can’t say that I thought it was head and shoulders above a Stilton (which many people believe). But it was certainly a knock-out blue cheese. Have you tasted Stichelton? Tell me what you think – better than Stilton or couldn’t tell the difference? Additional research from: Great Food Mag, Raymond Blanc Le Blog and Cheddarbound. I love Stichelton. I can’t say I’ve tasted every Stilton ever made but Stichelton is head and shoulders above some rival cheeses I’ve tried and I always grab some (not necessarily in a night club) when I see it. Thank you 🙂 It’s certainly a quality cheese – and I do love their story and determination to produce an ‘old-fashioned’ Stilton in spite of all the legislation. Rebels indeed! Yes, if you spot any, definitely one to try! I keep reading about Stichelton, but haven’t seen anyone selling it yet – must be hanging out in the wrong nightclubs… Did you get to visit the dairy and see the cheese being made? No, no visit for this one. I saw it in a local cheesemongers but it’s the first time I’ve seen it anywhere. I think its availability is also a bit seasonal. One to watch out for! If you like blue cheese, it’s definitely one to look out for. Of course! I knew that about the raw milk ban. I’d love to make a Stilton but can’t begin to image how badly it would turn out; looking forward to seeing how you get on. All the best things are made in Nottinghamshire of course haha! I’ve got a real hankering to try some – is there a cheesemonger you’d recommend in London that might have some in stock? Or a nightclub? Do I detect some regional bias going on? 😉 All good cheesemongers will have it around now. I got it from Cannon & Cannon (Brixton), saw it in Neal’s Yard Dairy (Borough) today, or you could try Paxton & Whitfield. Or La Fromagerie. Or go to your local mongers and tell them to order it in forthwith. Always 😀 My Gran lives a few villages away, but had no idea they made the cheese there. Off to the mongers tomorrow!